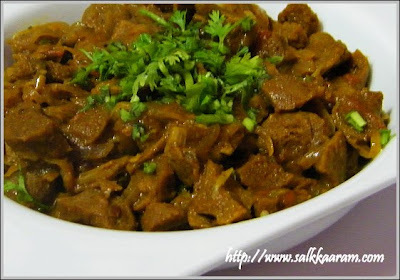 Soya Chunks Dry Curry | Simple and Delicious ! One more thing, many are taking too much of soy products because of the high protein content, and other nutrients. I know from some people that taking too much of soya products led them to kidney stones and other health related problems. So beware of including much soya in your food. Soak soya chunks in water for 2 hours. Chop them into four pieces. Saute garlic and ginger paste when the onions are transparent. Stir for a while, add tomatoes and all the powders except garam masala and pepper. Add soya chunks with enough salt. Add 1 cup water allow to cook. Check and if the water is reduced and chunks are not cooked well, add little more water to cook well. Add garam masala and pepper to this and mix well. When the curry turns thick and the chunks are cooked, add coconut-milk. 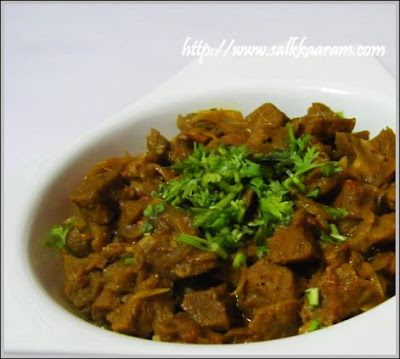 Allow to boil for few seconds and add coriander leaves to this. I don't know the actual cooking time for soy chunks and I cooked it for a long time, if you know please leave a comment. I have always seen soya chunks as a veggie version of meat. Curry sounds delicious with all those spices in there. About Soya chunks! Boil the water till big bubbles starts coming and remove from fire. Put soya chunks into it and cover for around 15-20 min. Drain that water and wash soya chunks in cold water once and squeeze away the excess water. And proceed to cook as per your recipe. The photo looks absolute mouth-watering. :) I do make it in an almost similar way, but have never tried with coconut milk. Will try i t next time and let you know. What you said is correct about the soya chunks, eating to much of it is not good for health. Here in Malaysia we use alot of soya chunks and soya byproduct for the veger meals. i always cook soy chunks separately in a cooker with little turmeric and salt for one whistle.after sauteing all masalas i add the chunks . Hello Seena, nice one, though I don't cook soya chunks much...haven't been here for a while..good to see the new layout! Belated Eid wishes Seena. The dry curry looks delicious. i'm planning to go to Guruvayur by Nov. last, insha Allah.what about u? would like to meet u one day. if Allah wills that shall happen, right? by the way, ur site is becoming better day by day.best wishes. Hai Seena, as a vegetarian who has not touched 'beef' & stuff, I used to hate soya, but I've come to my son's house & there is this packet of soya chunks staring at me on the shelf ! Not knowing what to do with it & without having the mind to throw it away, (My son wants proteins - is health conscious - goes to gym) I searched the internet & got this recipe. I'll try it. Thanx for the same. BTW, you are in Guruvayur ? wow ! i tried this recipe and thought it was so good but was so upset because i forgot to add this page to favourites!! lol anyway - spent days trying to remember the search terms and here it is. so pleased - the food was very tasty. very grateful to you for publishing this. thank you, for your recipe..have a great life.